Monster EF-4 Tornado That Hit Ringgold, GA. This was a tornado that was on the ground for more than 50 miles. Thanks to Sandra for this pic! A very rare EF-4 tornado took place Wednesday, April 27th, just after 8 pm ET in Catoosa County, Georgia. This tornado would go on to kill 7 people. It also blow tractor trailers, semis & automobiles off I-75 as well. This blog includes information on the storm’s continuation into Hamilton, Bradley, & Polk Counties in Tennessee. Here is a Google Earth representation of the path that this tornado took that the Atlanta NWS did. A Google Earth representation of the path that the EF-4 tornado in Ringgold, GA tornado took. Picture courtesy of the Atlanta NWS weather office. Also, this image was along Cherokee Valley Road northeast of Ringgold. Here 4 out of the 7 people died in this area from this tornado. Below is the write up that the Atlanta NWS did on this tornado. A NATIONAL WEATHER SERVICE STORM SURVEY TEAM DETERMINED THAT AN EF4 TORNADO WITH WINDS OF 175 MPH OCCURRED IN CATOOSA COUNTY. IT TOUCHED DOWN APPROXIMATELY 813 PM EDT WEDNESDAY EVENING ALONG DAVIS RIDGE ROAD…TRAVELING THROUGH RINGGOLD TO NORTHWEST OF COHUTTA AND INTO TENNESSEE AROUND 828 PM EDT. THE PATH LENGTH WAS 13 MILES WITH A WIDTH OF ONE THIRD OF A MILE. SEVEN FATALITIES AND 30 INJURIES OCCURRED WITH THIS TORNADO. 75 TO 100 HOMES WERE DAMAGED OR DESTROYED. THE WORST DAMAGE WAS LOCATED ON CHEROKEE VALLEY ROAD WHERE 12 HOMES WERE OBLITERATED. 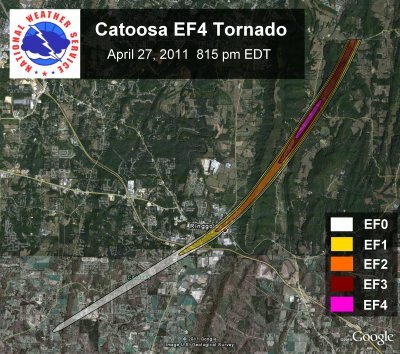 A NATIONAL WEATHER SERVICE STORM SURVEY DETERMINED THAT AN EF4 TORNADO WITH WINDS OF 175 MPH OCCURRED IN CATOOSA COUNTY AS PART OF THE HISTORIC APRIL 27-28 2011 OUTBREAK. EF4 TORNADOES ARE VERY RARE IN GEORGIA. INCLUDING THIS EVENT…ONLY EIGHT EF4/F4 TORNADOES HAVE OCCURRED IN GEORGIA SINCE 1950. This storm continued into Bradley, Polk & Hamilton County Tennessee. Here is what the Knoxville, TN weather office wrote on this. 8:29 PM, 04/27/2011: Tornado, 4 SE Collegedale, Hamilton, TN. 13 FATAL *** EF4. MAX WIND SPEED 190 MPH. PATH WIDTH 800 YARDS. PATH LENGTH 35 MILES. NORTHEAST TRACK CONTINUES THROUGH BRADLEY COUNTY AND INTO POLK COUNTY. THE NATIONAL WEATHER SERVICE IN MORRISTOWN HAS COMPLETED AN ASSESSMENTOF THE STORM DAMAGE THAT OCCURRED IN HAMILTON…BRADLEY…AND POLK COUNTIES. THE TORNADO REACHED AN INTENSITY OF A STRONG EF4 IN SOUTHEAST HAMILTON COUNTY WITH A MAXIMUM WIND SPEED OF 190 MPH. THE TORNADO COMPLETELY LEVELED SEVERAL HOMES IN HAMILTON COUNTY…AND PRODUCED EXTENSIVE DAMAGE IN BRADLEY COUNTY BEFORE DISSIPATING IN POLK COUNTY. 150 HOMES WERE ESTIMATED TO HAVE DAMAGE IN HAMILTON…AND BRADLEY COUNTIES…WITH NUMEROUS TREES DOWN IN POLK. THE PATH WIDTH OF THIS TORNADO WAS 800 YARDS OR ROUGHLY ONE HALF OF A MILE. THE TOTAL LENGTH OF ITS TRACK WAS 35 MILES. PRELIMINARY REPORTS INDICATE 13 FATALITIES…8 IN HAMILTON COUNTY…AND 5 IN BRADLEY COUNTY. By the time all was said and done, this tornado was on the ground close to 50 miles. All this info is preliminary and is subject to change. It’s hard to tell if this was one tornado or two, as well. Thanks again to Sandra for the clarification on that! And I agree with Sandra. I thought this tornado might go EF-5 as well. It still might, we don’t know! Also, big thanks to Paul, in response to what Sarah posted up above and who added this as well. “I noticed this as well when I was at my parents house last weekend. My parents live in the back of Sharondale Estates off Poplar Springs. The tornado went directly over our back yard downing 11 large mature trees, but not strong enough to do any structural damage. The path went westward from my parents back yard paralleling Poplar Springs crossing Holcomb Road as you mentioned. I thought that was the one and only path, but later while driving back over on Dedmon Road realized all the damage at Bent Tree and Misty Ridge subdivision. Not the same path, but close by. It does appear the paths merged and strengthen and the Ace Hardware and Food Lion.” Thanks for your post, Paul. Sandra also had sent me some pics of this tornado. I have included 3 of those pictures below plus one to start this blog off. I have more pictures of this tornado. I will let you, my blog viewers decide if I should post all 6 of them or just these 4. Here are 2 of the tornado pics below. 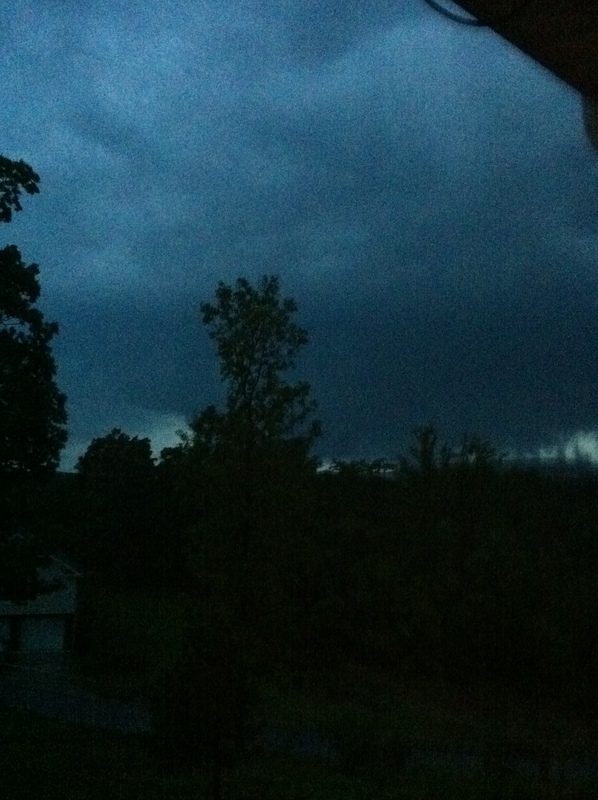 Second pic of the Ringgold tornado. Keep in mind, this tornado was on the ground for over 50 miles!! Pic 3 of the Ringgold tornado. More Information/Author’s Note: This twister set down along Davis Ridge Road in Catoosa County, Georgia, before reaching the towns of Ringgold and tracking just northwest of Cohutta. Between 75 and 100 homes were damaged or destroyed; with the most severe damage occurring on Cherokee Valley Road in Catoosa County, where twelve homes were flattened. A Super 8 Motel, located near Interstate 75 was also flattened by the tornado, along with a McDonald’s, a Taco Bell and several gas stations located on Highway 151 in Ringgold at the Interstate 75 interchange (exit 348), and the Catoosa County Department of Family and Children Services and other businesses on Nashville Street in downtown Ringgold. The Kellerhals Center for Visual Arts Education at Ringgold High School was destroyed, and Ringgold Middle School was heavily damaged. The storm then crossed the Tennessee state line at 8:28 p.m. EDT, into Hamilton and Bradley County, Tennessee, and became a strong EF4, before lifting in Polk County; several homes in Hamilton County were leveled, with 150 homes suffering varying damage in Hamilton and Bradley Counties. Several trees fell in Polk County, before the tornado dissipated. All roads in and out of Ringgold were closed until the morning of April 29; after roads leading to the affected areas were reopened, residents and business owners were allowed to return, being allowed entry only by providing identification, and informing police a reason why they are entering into the area, in order to curb looting in the storm-damaged areas. The tornado killed twenty people along its 48 mile path across Catoosa, Hamilton and Bradley Counties (including eight fatalities in Ringgold, ranging in age from 16 to 86 years old, including an entire family of four), and at least thirty others were injured, some sustaining serious injuries. The tornado was given a preliminary rating of EF4 with winds estimated between 175-190 mph, though it may have been stronger elsewhere along the path, pending further analysis during the storm survey. The damage path of the tornado was between one-third and one-half mile wide. This tornado is only the eighth in Georgia to be categorized as an EF4 or F4 on the (Enhanced) Fujita Scale, since official tornado records have been kept in 1950. Thank you to all who have contributed to this blog post. Without you, who witnessed this tornado, this post wouldn’t be as good as it was originally. I would like to dispute the statement that the tornado went to Cohutta from Ringgold. I live on Keith Road outside of the city. We live on a ridge off Condra. If you were to draw a line west it would go to around a litle north of Happy Lane on Cherokee Valley Rd. A line East would take you to Cohutta. When the Channel 3 weather man said the tornado would be in the Keith area in a 20 I went to our back porch to look. I was horrified as I saw it behind Sand Mtn. I ran back in the house and got my cell phone and had my husband and mother come and look. I wanted to make sure it didn’t turn toward us. It was HUGE and we could hear it moan and groan as it churned it’s way toward Apison. I called my daughter to warn her… It killed six people a half mile from her. There was no damage where she lived. I filmed the cloud as it traveled and it didn’t turn toward Cohutta from our vantage point. Our daughter lives between Bates Rd. and Alabama…we always call here when we see storms headed that way… We have heard nothing of storm damage in Cohutta. Our neighbor has gone to Red Clay park every day since the tornado and has had not problems getting there. That is not far from Cohutta. What do you think?? Why was Cherokee Valley Rd. not an F5 rating..it is horrific to see! When I look at the map that the Atlanta NWS did and cross referenced it to my Google Earth program, it missed Cohutta by 3 or 4 miles to the northwest. tree subdivision off dedmon road and part of my subdivision stonecrest to Holcomb road. Myneighbors and I all think there were two tornadoes or funnel clouds at this point that came back together over the food lion at poplar springs and highway 151. I noticed this as well when I was at my parents house last weekend. My parents live in the back of Sharondale Estates off Popular Springs. The tornado went directly over our back yard downing 11 large mature trees, but not strong enough to do any structural damage. The path went westward from my parents back yard paralleling Popular Springs crossing Holcomb Road as you mentioned. I thought that was the one and only path, but later while driving back over on Dedmon Road realized all the damage at Bent Tree and Misty Ridge subdivision. Not the same path, but close by. It does appear the paths merged and strengthen and the Ace Hardware and Food Lion. Thank you for commenting. I am thankful to you and the others for witnessing the tornado and adding what you witnessed to this blog post! Sorry it took me so long to get to your comment. I am thankful to people like you who have witnessed the damage from the tornado. I appreciate it. Thank you. That area has been hit hard. I am thankful for people like you who live in that area and are coming together to help each other. It makes me and my heart happy to hear about people like you! Sandra, can you post a link to the video? I saw some heavy storm clouds passing but didn’t see the actual tornado. No problem. My email is okcstormwatcher@gmail.com. I know how to place pictures into posts and I will use your pics. Saw my severe weather blogpost from last spring on your site.Thanx for getting this info out.Had a chance to tour Ringgold… I’ve never seen such complete devastation,esp on Cherokee Valley Rd— that’s the bad news.The good news is that I ran into many good people in that town,all of whom were resilient,optimistic and very thankful to have survived the storm.During my visits to Ringgold I detected a very strong sense of community,family and faith-based cooperation.I have no doubt that Ringgold will rebound from the sobering events of April 27,2011. Thank you as well. I even can see that resilient and optimistic side of Ringgold with some of the posts on here from folks in the Ringgold area. Seeing how towns around me in Oklahoma City can rebuild after that kind of devastation, Ringgold will be back stronger than ever. i agree, Ringgold will most definately bounce back!! i seen the tornado as it was headed towards cherokee valley rd. I live on Salem Valley rd n we were so lucky it didnt come our way, it was huge, n the damage to cherokee was horrific, i have a friend who lives there, n thank god she is ok!!! and the pictures just dont do it justice, i feel so bad for the families who lost everything n for the ones who lost family n friends!My son knew the young man who lost his life in Apison Adam, n he also knew Chealsea the one who lived on cherokee, so sad! 12/28/11, We just went by Ringgold on I-75 south about 6:00 p.m. Today, and even long after the super outbreak we could still see the damage path left behind!! Also we crossed another large damage path about 30 miles or so north of Atlanta. That damage looked like EF 2 damage to me. It made me have flash backs to 1985 in Northern Penn . I’m glad I was in Florida this year and well south of this nightmare! People told me that live near Ringgold couldn’t believe the damage. I saw some pics from that storm. One of the worse ones I can recall seeing. I grew up in Ringgold my entire life and my family still resides there. When the tornado touched down it was beside my family’s home on Dedmon Road! As I watched the warnings roll across the tv screen at my home in Hixson TN, my stomach dropped. My many attempts to reach my mother were failures, she finally called me back and told me they had LOTS of trees down around the house, the back porch had been ripped off of the house, and both of one of our barns was completely destroyed! When I was able to get into town, what was there was just gut wrenching and devastating! It looked like something out of a movie. I have never prayed so hard or been so thankful for my family! Today, my hometown is coming back together. Then again everyone helped each other through this catastrophe so my hometown was together, it just did not look like it. As tornado season is quickly approaching, we all now have weather radios and are better prepared for emergencies like this. Everytime I go to visit my family, I get chills seeing all of the trees that are still down and the homes missing that were so familiar for such a long time. Seeing the pics people sent me of the damage, I was blown away. I thought when the storms came through here in May of 2011, I was amazed at the EF5 devastation. Ringgold was an EF4 and that was unreal. Glad to here that people are rebuilding. Blown away by people coming together after such an event. Be it Ringgold, Tuscaloosa of last year or the Branson and Harrisburg tornadoes today. Keep me posted on how things go in Ringgold. Happy first day of (solar) summer!